At Fairy Fun Fridays this week the challenge is to do a card with Buttons and Bows and this simple little idea is what I came up with. 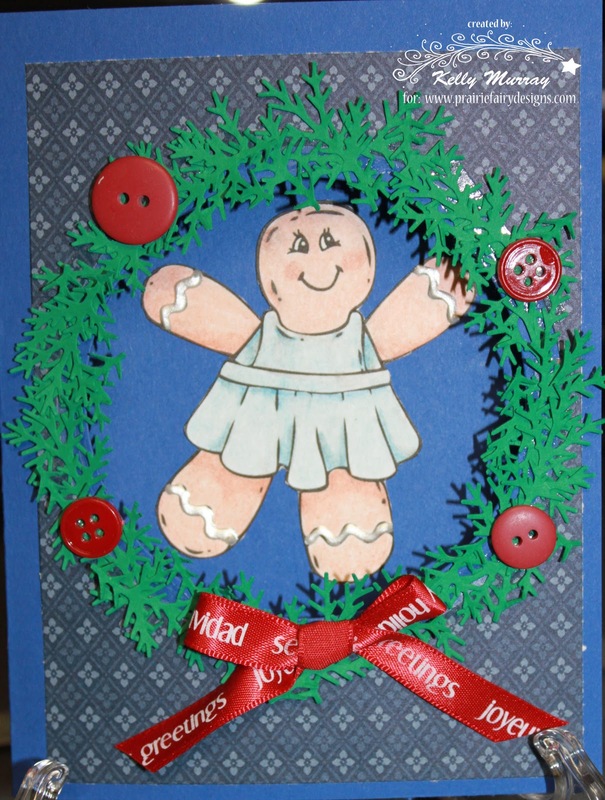 The image is Ginger Girl and can be found at Prairie Fairy Designs. Don't miss out entering the challenge this week so that you have the opportunity to win some fantastic images from our Fairy Queen. gorgeous card with that sweet Ginger girl.......fab colouring and your wreath is spectacular.....have a nice weekend! What a fun card!! I just love the wreath!! The buttons are perfect! I had a great time joining you girls as a guest for this challenge. Love the image used and the wreath you have created using buttons for the berries. What a lovely Christmas Card! Thanks so much for joining us at The Creative Cottage and good luck! Such a sweet gingerbread girl and I love how you have framed here in that cool wreath you made. Such a happy card - made me start grinning as soon as I saw it! What a cute card, such a sweet image. Thanks for entering the challenge at creative inspirations. What a cute gingerbread girl! Thanks for joining us for this week's Critter Sketch Challenge and we hope you will come back and play again next week! Thanks for joining us at Fab 'n' Funky this week, hope you join us again next time. Very cute and the wreath is adorable! Thanks for joining us at Critter Sketch Challenges!